A step wizard is a user interface component that helps a site’s visitor know what’s going on during a multiple-steps action. For instance, an online purchase. It is commonly used on payment forms describing the different steps to complete the desired action, as well as the current step. I think it’s a good UI component as not only does it help in figuring how long an action could take, it also provides some context: what have I done so far? What’s left to do? Can I go back? Can I skip this step? I think that the markup for a step-wizard should be an ordered list. Since steps are advancing one after another, the order matters. Hence, an ordered list (<ol>). Each item should be a list item (<li>), containing a link (<a>) or an anonymous element (<span>) if there is no link. That’s it. Regarding naming, I went with something BEM-like (Block Element Modifier) since this is a perfect fit for such a methodology. If you are not familiar with BEM, I suggest you read this article introduction by (who else) Harry Roberts. steps__link for either links or spans. Also, we will add a disabled attribute to items coming after the current step. Okay, that seems like a very good start! Before we jump ahead and start styling, we should declare a couple of variables. This is in order to avoid duplicating values that could be customized, and to keep everything that can be customized at the top of the stylesheet. Now that we’ve set all our variables, we are ready to move forward. First thing first, let’s use a decent box-model. BOX-SIZING: BORDER-BOX ALL THE THINGS! 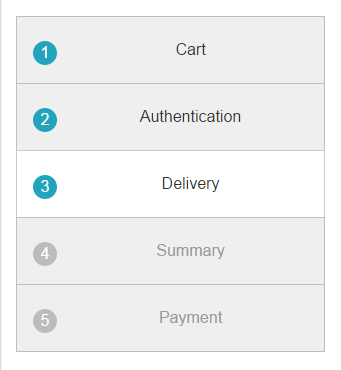 Display the counter with the :before pseudo-element from.steps__item`. Note: if you are not familiar with CSS counters, I suggest you read this article from me on Codrops. * in selecting the step-wizard. * 2. Hides default numbering. * 3. Initializes a CSS counter called `steps` on the step-wizard. * 4. Clears inner floats. * 5. Resets initial padding. * 6. Applies vertical rhythm. So, we have our container ready and we can now give its children some styling. * to something a bit more explicit. You may have noticed we haven’t sized the steps yet. Remember how we want to allow any number of items (in a decent range, at least)? That means we need to know the number of steps to size them. Ouch, that’s rough. How are we going to do that? // to have a step-wizard hosting over 10 items. // In most cases, looping through 1 to 5 is more than enough. So this is the safe way, which works back to Internet Explorer 7 (not 6, which does not support attribute selectors). I went with the CSS craziness way, inspired by Lea Verou’s technique to style elements based on the number of siblings. Okay, that’s definitely some decent amount of CSS but that does the trick! Yes, as I’ve said before, chances are high that the maximum number of steps in a step wizard would be more like 5 or 6, not 10 or more. At this point it should be getting somewhere. It still needs some extra details but at least it does the job. There is no layout issue anymore, it’s accessible, readable and so on. We have used an ordered list but we removed the numbers. We initialized a CSS counter, incremented on each step so it’s time we display this counter using a pseudo-element. This pseudo-element will be hosted by .steps__link because at this point it’s text content. There is no magic here, it’s a sized pseudo-element with counter content as well as some extra styles to make it pretty. Let’s add the little arrows using pseudo-elements! Basically, each item but the last will have a pseudo-element shaped as a square on it’s very right, rotated to look like an arrow. A little tricky to set up, but we’ll make it! Now, let’s start with a little bit of math, shall we? We are going to rotate the squares by 45 degrees so their angles are facing top, right, bottom and left directly. To make it look right, we’ll need to make sure the diagonal of the square is strictly equal to the height of a step item. And this involves some calculations. We know the tallest content is the number we just added and we hard-coded its height to be three times the baseline. We know the vertical padding on links is equal to the base line. And finally, we have two 1px borders. Easy! Okay we got everything, let’s write the code! There is little to be done so the current step actually looks like it’s being highlighted. We only need to change the background color. Since pseudo-elements color are relative to the background color, everything will work just fine. We also have to change the text color on both done and active steps, as well as the number background-color. Small things, but that’s what makes the step-wizard so nice. Last but not least, we have to make sure it looks okay on small screens. I went with stacking all items one under the others so it still feels like a step-based process. Unfortunately, the first one cannot be easily polyfilled with CSS only, so I suggest you avoid advanced CSS selectors altogether if you have to support legacy browsers: just add more classes to the DOM. Last but not least, generated content: unfortunately, it is not possible to detect generated content support for Features Queries, so in order to fix this last bite, I suggest you have Modernizr. This rules put back the default numbering from the ordered list if pseudo-elements cannot be displayed. Pretty handy! That’s it folks! Hope you liked the explanation, and if you can think of anything to improve it, be sure to share! See the Pen A Step wizard built with BEM and Sass by SitePoint (@SitePoint) on CodePen. CSS goblin. Sass hacker. Margin psycho. Author of Sass Guidelines, SassDoc, Sass Compatibility, Browserhacks and a lot of Sass stuff.